It took me and Lynda (Lynda and I?) a while to come up with a time that we could get together to get started on our home-made condiments project, but we finally met late this morning at the Red Apple (the one south of Belmont) so we could officially begin proceedings. 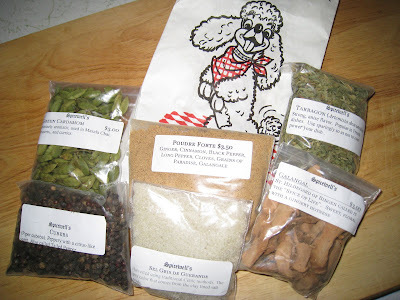 But before we could begin with new business, Lynda handed me a bag full of spicy surprises for my holiday gift! I know this is not the best picture, but there is a veritable treasure trove of spices in those little bags. They came from a woman who sells spices, mostly at SCA events I believe, that would have been used in medieval cooking. Now on to the order of the day. Over cabbage rolls, brats and sauerkraut, potato pancakes, beet salad (and much much more) we planned our strategy. The recipe we have decided to use for our Worcestershire sauce calls for the sauce to age for three weeks before you start to use it. We decided to start with that, and we will both plan to make it next weekend, so it will be ready toward the end of February. Then we will get together and compare our processes and our results. 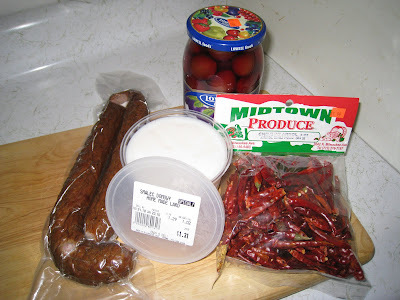 After we had made our plan and finished our meal, we wandered down Milwaukee and visited the small food and meat shops. Lynda was looking for some pickled vegetables for a recipe she wants to make, and I was just . . . well . . . looking. And found a few items of my own. Starting at the left, that's a smoked sausage that the gentleman standing next to us at the counter said "Is best! Freshest!" So we grabbed some. Next to that is some honest to goodness, home-made lard. In case you didn't know, lard is making a bit of a comeback. I have been wanting to try it for a while, but all I could find at my grocery store is the commercial kind, that has partially-hydrogenated oils in it. This is the real deal, rendered straight from the pig, and I was so excited when I saw it that I might just have squealed like a pig myself. The chilies del arbol are for the Worcestershire sauce. And that jar at the back there is filled with plums in light syrup. What was I thinking? I'm not sure, but they were just different enough to pique my interest. There are many possibilities - sweet, savory, jam, pie? Of course, I will do a little research and see if there's anything special one does with them if one is in Eastern Europe. So that was my day today. Color me excited. I can't wait to get started on the Worcestershire sauce next weekend. I have all of the ingredients except for the anchovy and the star anise. And I think I saw some star anise at the Asian grocery store Nicole and I went to the weekend before last. Oh - if you want to join us and make your own Worcestershire sauce you would be most welcome. You can find the recipe at Saveur.com.